The 2014 IEEE International Ultrasonics Symposium - Chicago (September 3-6) serves as a premier venue for bringing researchers and scientists from academia and industry together to share cutting-edge advances in ultrasonics research and inspire new ideas and collaborations between scholars. I would like to acknowledge the dedication and unwavering commitment of the Organizing Committee and the Technical Program Committee who have put forth a remarkable effort to make this conference a memorable and successful experience. This year we have received a record number of abstracts and the Technical Program Committee members selected 938 papers for oral and poster presentations. These abstracts cover the five areas of focus for this meeting: Medical Ultrasonics, Sensors, NDE & Industrial Applications, Physical Acoustics, Microacoustics - SAW, FBAR & MEMS, and Transducers & Transducer Materials. The oral presentations include 24 invited papers highlighting emerging technologies or overviews of key areas. The poster presentations include the 20 student poster finalists competing for the Student Paper Awards. In order to accommodate the record number of presentations, the oral sessions are organized into seven parallel tracks over three days. I would like to thank Dr. Jan D'hooge, the Technical Program Committee Chair, who has been leading the organization of the symposium's technical program. I am particularly pleased that this year the conference will be returning to the vibrant city of Chicago after 26 years. 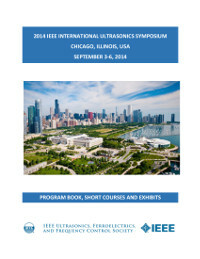 The annual 2014 IEEE International Ultrasonics Symposium will be held at the Hilton Hotel, Chicago, Illinois, USA from September 3-6, 2014. The hotel is easily accessed through either public transportation or by car. It is centrally located and within walking distance of the following attractions. Arrangements have also been made for a highly popular Chicago tour : Architecture River Cruise which spotlights more than 50 architecturally significant sites where participants will discover a new perspective on the city of Chicago. I would like to thank Dr. Erdal Oruklu, Symposium Local Chair, who has been arranging many special activities for our conference attendees. I sincerely encourage your participation in the conference and look forward to hosting you in the world class city of Chicago. The Symposium Program includes the full schedule of presentations with times and locations. The Abstract Book includes the abstracts of all submitted papers.